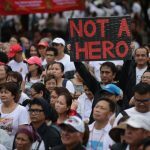 MANILA, Philippines – Of the hundreds that gathered to oppose the burial of the late dictator Ferdinand Marcos at the Libingan ng mga Bayani, a sizeable number at the Luneta on Sunday, August 14, were old enough to have lived through martial law. 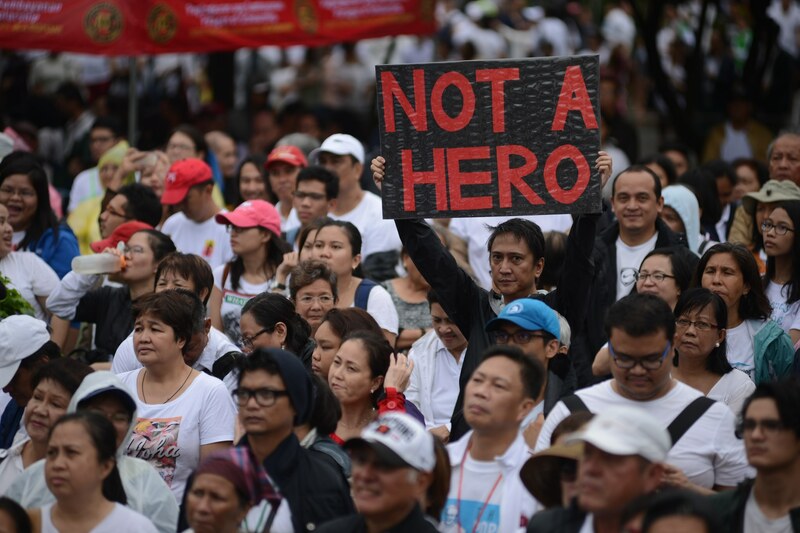 Members of religious groups, non-governmental organizations, as well as civilians stood in the crowd amid an on-and-off downpour, rallying against what they deemed a betrayal of history. La Loma Cemetery, located in Caloocan City, is where some notable Filipino figures like Josefa Llanes Escoda and Victorino Mapa are buried. Martija is a member of the non-violent organization Aksyon sa Kapayapaan at Katarungan (AKapKa). The group fought against the dictatorship through nonviolent means. “Kaya nandito ako [ay dahil] buong puso kong sinusuportahan ang pagkakaisa laban sa paglibing [kay Marcos] sa Libingan ng mga Bayani. Hindi siya karapat-dapat…hindi naman siya tunay na bayani,” Martija said. Martija hails from San Miguel, Leyte, the home province of former first lady and now Congresswoman Imelda Marcos. Senator Ferdinand “Bongbong” Marcos Jr won big in the province in the 2016 vice presidential race, claiming 49.5% of the votes. “[K]ababayan ko si Imelda…subali’t hindi ako sumusuporta sa kanya dahil lumalaban ako [para sa] kalayaan ng mamamayan. Noong panahon na ‘yon, walang demokrasya,” Martija said. “Nakakalungkot. Kailan natin makakamtan ang tunay na kalayaan (It’s very sad. When will we attain true freedom)?” Martija asked. Politicians alongside martial law victims gather in front of the Lapu-Lapu Monument in Luneta to protest against the motion to bury former President Ferdinand Marcon in the Libingan ng mga Bayani on August 14, 2016. “I was somewhere in Metro Manila, being sad because I knew that it was a false ending,” Bantayog ng mga Bayani Foundation trustee Carolina “Bobbie” Malay, 76, said of her whereabouts during the EDSA People Power Revolution of 1986. Malay was part of the communist resistance during martial law, and remained underground for almost two decades until her arrest, along with husband Satur Ocampo, whom she wed in revolutionary rites. Satur co-founded the National Democratic Front (NDF), which represented the Communist Party of the Philippines (CPP) and the New People’s Army (NPA), while underground. Both he and Malay were part of the NDF’s negotiating panel during peace talks with the government of Corazon Aquino. They would again be arrested in 1992 after the collapse of negotiations between the government and the Left. While underground, Malay wrote for Taliba ng Bayan, an alternative newspaper published by the NDF from 1972 until the early 1980s, during the dictatorship. Before that, she wrote for The Manila Times and Evening News. “What I joined the movement for was to have change in society. Marcos was a big part of what we were fighting, but it was not the entire thing. I was aware of the injustice and the poverty, the unequal distribution of privilege and power…and I wanted to be part of changing that,” Malay said. While she thought the fall of the dictatorship at EDSA was a “job [that] was not yet done,” she said she still felt nostalgic for people power, witnessing the assembly at Luneta on Sunday. 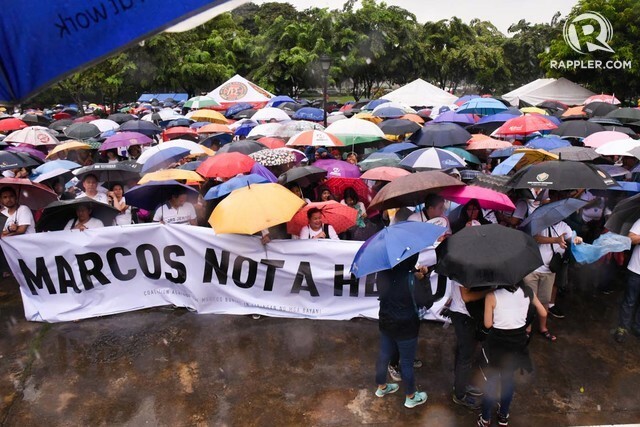 “I think many of the people who are here (in Luneta) today were part of that (EDSA) – a very significant part of it has remained in our hearts, in our minds. [It is] very encouraging to see that the fight continues, [that the] people are ready to rise to the occasion,” Malay said. Rose Hidalgo remembers caring for her newborn child in the dark. “Nanganak ako noong September 19, 1972…noong 21 nag-blackout (I gave birth on September 19, 1972…on the 21st there was a blackout),” she recalled. “Talagang dark era [noon] (It was truly a dark era),” Hidalgo said. Her child would spend the first few days of life in a dark hospital ward, at the dawn of martial law; it was a portent of things to come. 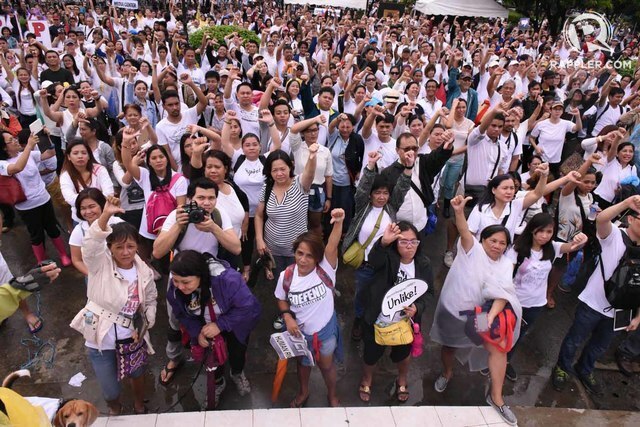 “Masama ang loob ko na maraming kabataan ang nagsasabing kalimutan na lang [ang nangyari noon] (It pains me that many young people today say that we should just forget what happened before),” she added. She made it a point to always tell her children about the wrongs of the Marcos regime as they were growing up.